NB. I’ve included some detail about how to connect Alexa to a BT Homehub, as it definitely seems to be causing an issue to many users who get Error: 7:3:0:0:1. Hopefully this page will help a little. Amazon has been somewhat tardy in bringing the Echo to the UK. It launched in the US in November 2014, so it taken nearly two full years for the device to cross the Pond. So this review is nothing new and there are no doubt hundreds of others on the web. Nonetheless, localisation was always going to be a key part of the device being made available in the UK. We don’t tend to think about it, using a service like Google Assistant (née Google Now) in the US is a vastly superior experience compared with using it in the UK. Google has tied down all the key US services, and suddenly it’s an invaluable service as opposed to an OK service as it was in the UK, although the UK has improved over time. Indeed I suspect the reason for the long delay in Alexa reaching the UK is that it takes time and resources to localise it for each market. I’d been keen to try Amazon Alexa out since I first saw what it was capable of. It does seem that the Echo (the device), and Alexa (the service), is very powerful in interpreting spoken word English and giving you back what you want. For those who don’t know, the Echo is basically a cylindrical speaker that’s about 24 cm tall. At its top is an array of microphones that can listen to commands from all directions, with an LED light ring indicating what it’s doing and a manual volume control sitting at the very top. A couple of buttons are there to either mute the device or to help with some set-up and pairing processes. 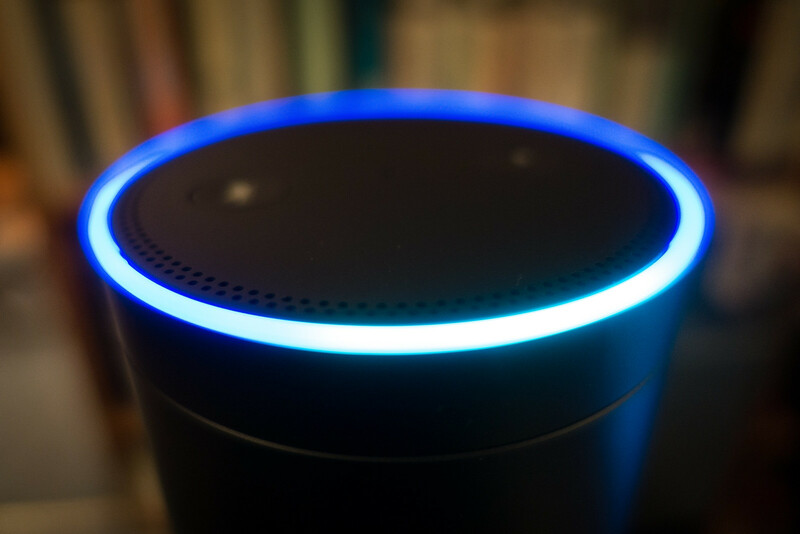 Alexa is the technology that sits behind the Echo, listening out for a command word – “Alexa” being the default – and then either playing audio or performing tasks as directed. These range from Siri or Google Assistant style answers to questions (“What’s the capital of Australia”, “How many yards in a mile”), to online shopping since this is of course Amazon, making diary arrangements, playing music from a connected service to controlling your smart home devices (e.g. your lights or your thermostat). Key to all of these are what Amazon call “Skills.” These are developed by third parties such as Uber, The Guardian or National Rail, and they allow you to use their technologies to perform other tasks by voice control. Audio as an interface is really interesting, and of course has the potential to have an impact on audio/radio services. So I was particularly curious to see the Amazon Alexa implementation of these services. While I bought the Echo device, Amazon also sell the Dot, a cheaper device that doesn’t have a powerful inbuilt speaker. It’s designed to contain microphones, but to be plugged into an existing speaker via an Aux cable. Well, these are based on some early experimentation with the device. I’ll perhaps return to this review, or offer additional thoughts, when I’ve played for it for longer or more services and Skills have launched. Note: Including detailed instructions of how to connect Alexa to a BT Homehub. Setup is designed to be simple. The preferred way is to install an app on your phone and set it up from there. The device essentially needs to be connected to your WiFi network. Unfortunately, I found it more complex than it should have been, to the point that if my problems are common, this will cause lots of headaches from the start for many users. Once you’ve powered the Echo, you open the App, the Android version of which you will be pleased to hear, is in the Google Play Store (other Amazon specific apps aren’t). Because I had already registered both a Fire TV and Fire TV Stick with Amazon, the app gave me lots of detail about them that at this point that I wasn’t interested in. Indeed, so cluttered was the screen that I couldn’t see how I should initially setup the device. I had to dive into the Settings menu to do it when it should really have been the first thing I was presented with. You either have to press a button on the Echo or power it on for the first time to get into setup mode, and then it’s a question of connecting your phone or tablet to the Echo’s own WiFi network to give it details of your WiFi password. This isn’t dissimilar to setting up a Chromecast. Unfortunately, no matter how many times I gave it details of my WiFi password it wouldn’t connect. So I tried from a Chromebook, since you don’t need to use a phone or a tablet. This failed to work too. Finally, fearing I may have a defective unit, I setup a portable hotspot on my phone, and tethered the Echo that way. It worked absolutely fine, so I knew it wasn’t a technical problem with the device. Trying once again to connect it to my WiFi router I noted the error code I kept receiving. Googling that took me to a Reddit page which contained what I took to be the solution. My router at home is a BT Homehub 4, and a quick search a day or so later suggests that I wasn’t alone in not being able to initially connect the Echo to my Homehub. 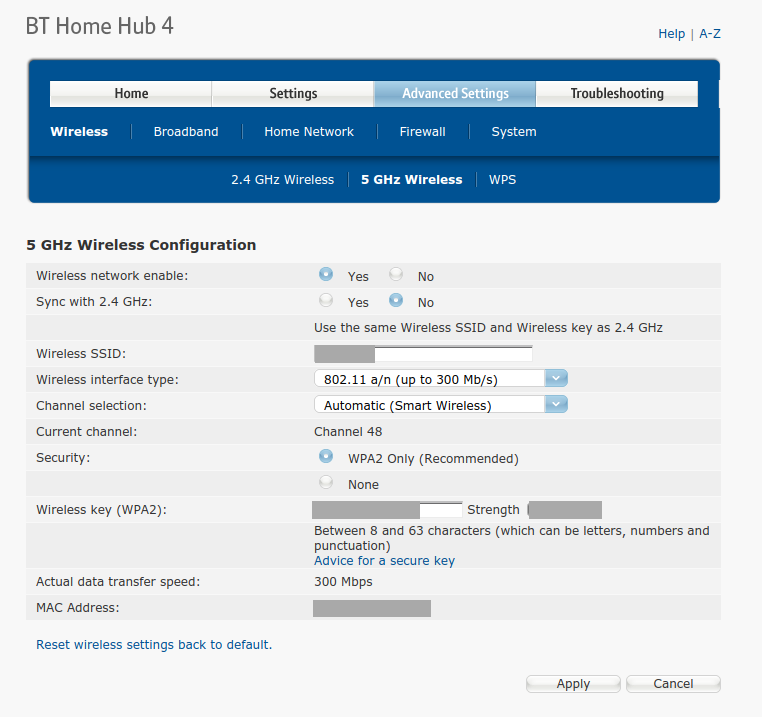 The Homehub 4 (and later versions) uses both 2.4GHz and 5GHz to broadcast WiFi on. All devices will connect on 2.4GHz, but more recently 5GHz frequencies were added to WiFi and newer devices will use both. By default the Homehub uses the same SSID for both frequencies. That means you see a single WiFi access point when you’re connecting a new device to your WiFi network, with that device connecting over either frequency. Even though the 5GHz frequency tends to perform better, I’d never seen fit to change the default, and all my WiFi devices worked fine choosing either frequency as they saw fit themselves. But it looks like, for whatever reason, the Echo really doesn’t like that. 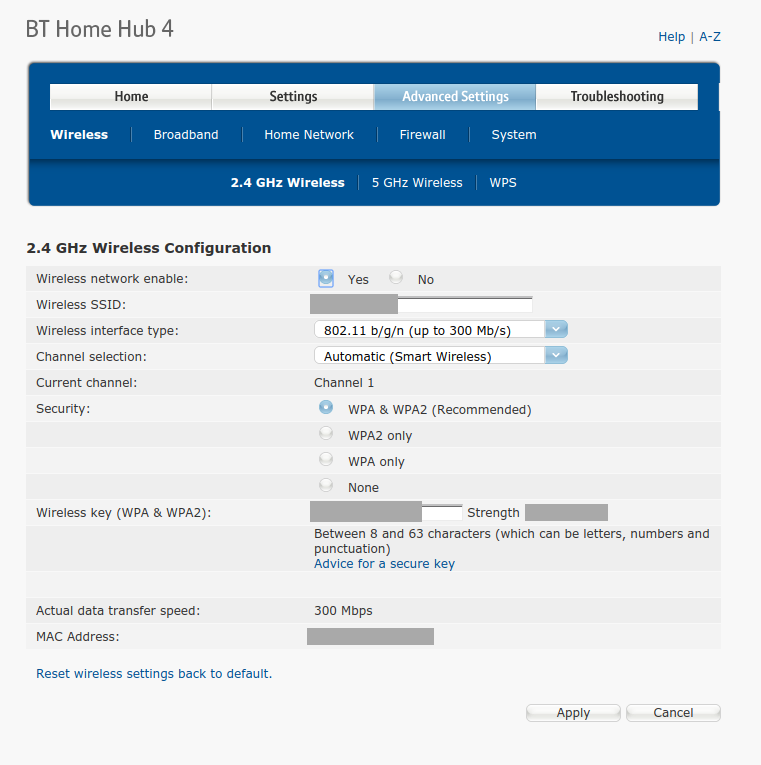 The solution I found was to go into the Advanced Settings on my BT Homehub router. 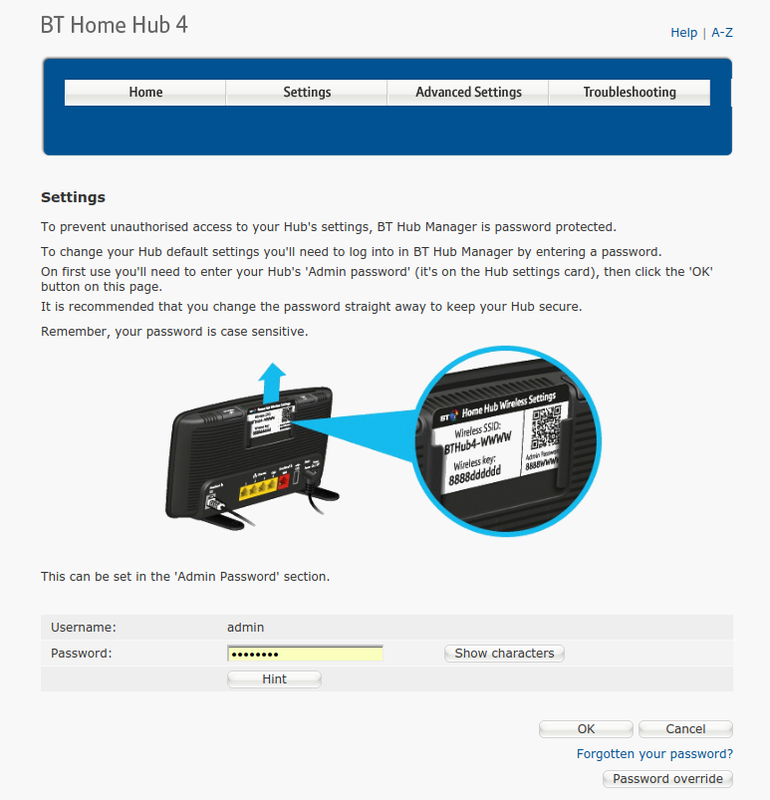 You will need the admin password to access this menu, which unless you’ve changed it, will be attached to your Homehub device. Then choose Wireless. There are then two tabs for 2.4GHz and 5GHz. You need to change one of the SSIDs so that your router has in effect two access points for each of the frequencies. I changed the name of the 2.4GHz SSID to something slightly different (e.g. add “1” to the end of the name), leaving the 5GHz SSID unchanged. On the 5GHz tab, ensure that “Sync with 2.4GHz” has “No” selected. Apply the changes, and then try the Echo’s WiFi connection process again. This time the Echo connected flawlessly for me. I was properly up and running. There are other solutions out there, but this worked for me. I’m surprised that Amazon/BT hadn’t fixed this ahead of launch, as BT is the biggest ISP in the UK, so there will be potentially millions of these routers in use. I certainly never had that issue with either the Fire TV or Fire TV Stick, nor any other WiFi device. Initially, I just left things as they were, with two slightly differently named SSIDs to my router. However, once the Echo was up and running, I found that I was able to rename the 2.4GHz SSID back to its original name, and the Echo still connected. This was useful as some legacy WiFi devices I own are unlikely to have the radios in them to work on 5GHz. Consequently I’d have had to have gone around and reconfigured all of these to work with the differently named SSID. Depending on how many older WiFi devices you have that you use, you may be happy leaving two different SSIDs running on your router. The first thing Amazon does once you’re setup is to watch a short video. Unlike those for the Fire TV products, this hasn’t been Anglicised. We get an American video that runs through some of the things Echo can do. Then you’re walked through some live examples, getting the news or playing some music. The ecology of Alexa seems to be multi-tiered. At the top level are things that will work for everyone out of the box. For example, answering questions with factual information, or telling jokes. Then there are those that are baked in as partnerships with Alexa. If you ask for a radio station to be played, it will by default be served by TuneIn. If you ask for the news, it comes from Sky News. The third tier are the Skills, and these tend to need a second keyword to alert Alexa that she should be looking there. There can be overlaps, with broadly the same services being offered by different parties, and depending on quite what you ask Alexa, the service that responds can vary. News is a good example. Alexa has what Amazon call “Flash briefings.” In other words, news headlines of the type a radio station might play at the top of the hour. If you ask Alexa to give you your flash briefing it will default to a Sky News bulletin from the last hour. I’ve not compared this with any radio output, but this is either an Amazon-specific bulletin, or as I suspect, a the same bulletin Sky News sends to commercial radio stations up and down the country. The bulletin seems to be timed from the last hour – 9pm, 10pm, 11pm etc – and lasts a couple of minutes. If you delve into the settings of the Flash Briefing in the app, you can find other news sources which you can turn on or off. Sky News is turned on by default in the UK, but you can turn others on. Annoyingly there’s no option to reorder them. So if you want your Flash Briefing to have more than one source, the default order the sources appear in Amazon’s list determines the order you hear them. This feels like something Amazon could fix. You’re also limited to the sources that Amazon has included, but there’s a reasonable range including the BBC, CNN, The Wall St Journal and others. I had a play with the BBC sources. First off is BBC Minute, which is a one minute bulletin produced every 30 minutes by the BBC World Service, and aimed at partner stations around the world (it’s not actually broadcast on the BBC World Service itself). The bulletin is available as a podcast and that’s how Alexa is pulling it in, serving the bulletin via TuneIn. There is also a BBC World Service news bulletin which again comes from TuneIn. This is a two minute bulletin and is your best bet for serious news. There’s the World Service Daily Commute, a thirty minute daily news podcast. Finally there’s a BBC Radio 4 option which unfortunately is the most recent Today Programme podcast. The Today Programme is of course a very fine morning news programme, but their podcast stream is complicated because it outputs around 3 different clips each morning – a business roundup, a more serious piece (e.g. their main 8:10am interview) and perhaps something a bit more quirky. None of those things are actually a news bulletin, and I wouldn’t really want them in my Flash Briefing. The sports section is frankly pretty poor. When you set it up on the app, you’re invited to select your favourite teams. A few Premier League teams were pre-selected for me. But I couldn’t find any Championship teams, let alone those lower down in the leagues. And there were no Scottish teams either! Nor could I find rugby or cricket teams. From what I could tell, this has only been very lightly localised with most of Alexa’s database filled with American sports teams of various sizes. This is really poor and those other teams need to be added as a matter of urgency. There are no national teams either. As I’m an Arsenal supporter, I’m OK for my favourite club. So I asked Alexa to tell me the latest score. That night Arsenal had just beaten FC Basel 2-0 in the Champions’ League. However, Alexa didn’t know that and only gave me last Saturday’s result against Chelsea, as well as alerting me to this weekend’s fixture. Good to know, but not enough. Amazon needs to buy in a lot more data sources to cover all the football competitions and plenty of other sports too. The sport is also very team oriented. If you want general news about cycling or F1, or want to know Andy Murray’s results, it’s simply not set up for it. It would have been rubbish during the Olympics. As well as baked in services like maintaining a to-do list or a shopping list, not necessarily just Amazon purchases either, although those are easy to manage, Alexa can also integrate with your calendar. At least if you’re calendar is a Google calendar. I couldn’t see how to make it work with Outlook or iCalc. Fortunately, my personal calendar is indeed a Google one, and you can get Alexa to tell your day’s appointments as well as add things to your calendar. What I didn’t see was any email integration. Amazon does warn you that your calendar will be available to everyone in your household, so it’s worth bearing in mind depending on who’s using Alexa. Music playback is a key part of Alexa, and it works with a number of services – notably Amazon Prime Music (of course) and Spotify. You can choose a default service, and asking Alexa to play Coldplay will come from your choice of service. Notably, it won’t work with either Google Play Music or Apple Music, at least without using the workaround of playing via Bluetooth. It is relatively easy to pair your phone or tablet to Alexa via Bluetooth, and then use a voice command to connect and disconnect your device accordingly. That means that you can listen to those services, but of course Bluetooth streaming does eat more battery than something like Chromecast. Incidentally, there’s no Aux socket on the Echo, so you can’t use it as a dumb speaker for sending your audio to. As I’ve mentioned, radio by default, comes from TuneIn. So if you ask Alexa to “play Radio 1” or “ESPN Radio” it will come via TuneIn. That does lead to some oddities. I asked, “Alexa, play Capital Radio,” and it dutifully played Capital Radio. The Madrid-based, Spanish-language Capital Radio who seem to be a speech service. To be fair, when I rephrased that as “Capital FM” it worked. Then I asked, “Alexa, play CNN Radio,” and it played CNN Radio Turkiye, CNN’s Turkish partner service. On the other hand, TuneIn selected the correct UK version of Virgin Radio when asked. Fortunately RadioPlayer is a skill on Alexa, and that means you can get all the British services by specifying “RadioPlayer” in your command. So if you say something like “Alexa, ask RadioPlayer to play Capital Radio,” you’ll get a local UK version (RadioPlayer asks you for your closest city when you set it up, so it will serve me, for instance, Capital London). Given the multiplicity of similarly named stations around the world, Radioplayer is the safer bet for getting the UK station you expected. The only shortcoming I could find is the lack of on demand programming which the mobile app does offer. Having both TuneIn and Radioplayer means that I can get the same radio station in two different ways. “Alexa, play Absolute 80s,” will give me the same result as, “Alexa, ask RadioPlayer to play Absolute 80s.” To my ears, they sounded the same. Also, in my tests, I heard no pre-rolls for any of these stations. And when I tuned into ESPN Radio, no geo-blocking seemed to prevent me listening to a baseball game they were broadcasting. It’d be great if I could teach Alexa to use Radioplayer in the first instance, and then drop back to TuneIn if it can’t find the service I’m asking for. Each of the Skills you enable on Amazon – and you do have to actively enable them – means learning a few new commands. I enabled The Guardian (The Telegraph and Mail were both there too), and you have to say, “Alexa, open The Guardian” to get into a voice sub-menu. Alexa reads back the top three headlines and you can choose to have an article read to you. Because these are likely to be chunky stories, it will alert you to the fact that reading the article might take five minutes. “Alexa, stop,” is a useful command. The Guardian also allows you to listen to its sports news as well as podcasts and other parts of the paper. The key here is how easy they’ve made it to navigate their articles, and how much information they’ve put into their details in the Skills section of the app/website. The more, the better! Sometimes the US origins of this device shine through. You can set up your commute on Alexa, but that actually means your driving commute. Alexa will helpfully tell you about traffic congestion on your drive to work. But what if your commute is via rail? Fortunately, National Rail is a partner and you can enable its Skill. It quickly asks you to set up your rail commute. As long as both ends are National Rail stations, it works (although in comments, I see some struggled with getting the right local station variant understood). If your commute is Cambridge to London King’s Cross, then it’s fine. But if it’s Cambridge to Oxford Circus, then you might want both information on the National Rail part of the journey and details about the Victoria Line. National Rail can’t help you with the latter. TfL would be a really useful Skills addition for Londoners, as would other regional transport companies. One disappointment so far is listening to podcasts. I use PocketCasts to play my podcasts, and that does mean that I have a uniform list of podcasts across different devices and platforms no matter how I listen to them. If I listen to a podcast in one place, PocketCasts in all the others knows I’ve heard it. PocketCasts is Chromecast enabled too. From what I can see, aside from going via a specific app like The Guardian, podcasts are delivered via TuneIn, but they seem to be very hit and miss. When I asked for This American Life, I got some kind of 24 hour This American Life stream which was obviously mid-episode. On the other hand, asking for 99% Invisible got me straight to the most recent episode. I tried getting both Guardian Football Weekly and the Telegraph Cycling Podcast, but despite trying lots of variants, Alexa failed to find either. Indeed at one point, she decided to play me an audio book from my Audible account! That’s great in itself, but wasn’t what I was after here. One thing that is absolutely seamless is hooking Alexa up with Philips Hue lightbulbs. Yes… I have some. Having done this you can bark commands like, “Alexa turn on Hall lights,” or “Alexa, turn off Flat lights.” And it does so very quickly indeed. It’s at this point that you begin to think that you’re living out all your science fiction dreams! Other Skills I’ve yet to turn on include Uber, Just Eat, and Jamie Oliver. There is a reasonable collection of them, but they could do with more. In recent months, Amazon has been adding Skills almost daily in the US, so let’s hope they’ll take a proactive approach in the UK too. One real disappointment is the Echo speaker itself. Whisper it, but it’s not that great. Sat next to my dumb Sony X55 Bluetooth speaker, the difference in sound quality is clear. They both cost me similar amounts. Indeed I bought the Echo at a special launch discount of £99. It’s back to £149 now. I bought the Echo knowing it wasn’t that great sounding, but it’s a shame Amazon didn’t improve on it a bit in time for the UK release. However the volume is perfectly good for filling a room. I wouldn’t use it for a party, but it’s fine for listening in general – aside from being mono of course. You can control the volume either with the dial on the top of the device, or by saying something like, “Alexa, volume 5.” The only problem I had was after pumping the volume up to 9, Alexa could no longer hear me above the sound of the music it was playing! I had to walk over and manually turn the volume down to regain voice control. There’s no audio out from the Echo, so you can’t send stereo sound to a better speaker system either. On the other hand the much cheaper (£49) Echo Dot does allow you to send the output to another speaker via a 3.5mm jack. At that price, Amazon might sell stacks of these things. The microphone pick-up is really excellent. Alexa hears her name above a certain amount of ambient sound (but not maximum volume as I say), and the range is decent enough that I’m able to send instructions to Alexa from my living room and bedroom. But then I don’t live in a mansion. I note that Amazon will be bundling 6 Dots for the price of 5, so clearly they’re aiming at a multi-room world. Using either these or Chromecast Audio devices is vastly cheaper than something like a Sonos system. In my experience, response time of the Echo is really excellent. Amazon has obviously worked hard interpreting audio as efficiently and effectively as possible. Yes, I have a fast broadband connection, but the Echo is ridiculously fast serving you with what you want. There really is minimal delay in it doing what you asked. It’s mightily impressive. One small downside is responding to secondary questions. In some instances, a call-response-call-response is required, and if you’re not careful, you can drop back to the main menu. There is a certain language learning curve here, and sentences do need to be formed a bit more carefully than natural language. Another thing to note is that, so far, I’ve not heard any advertising beyond standard broadcast radio ads. The National Rail mobile app, for example, is advertising supported, but there’s none of that hear. It’s all a nice clean interface. We’ll see if anyone starts adding audio ads. The one thing that did worry me lot before buying the Echo was the fact that I was essentially buying some kind of bug to put into my home. For Alexa to work, the microphones have to be live all the time. There is a mic-off button on the top which prevents Alexa from working if you choose, but surely everything else is being listened to all the time? Amazon assures users that Alexa is offline when listening out for its own name. Only when it hears its name and switches on the blue LED at the top does it start sending audio to Amazon’s servers for interpretation. I’m sure that were that not the case, someone would have found out quite quickly, but clearly there are privacy concerns, and I’m certainly not going to ignore them. I bought the Echo as much as anything to experiment. In many respects, it may have been smarter to wait for the upcoming Google Home device, which will potentially be cheaper, and more tied into Google services. In particular, my music is stored on Google, and I’m not about to replicate it on Amazon, at extra cost. And Google’s Chromecast infrastructure works well. I use it to play music in my bedroom on speakers and via my TV in my living room. Google Home will reputedly allow you to throw to TV from audio as necessary too. But it’s a bit of an unknown, with an expected retail announcement next week, that may or may not see it released in the UK. It’ll be worth looking out for, and there could be an interesting hardware battle played out between Google and Amazon (Apple, despite Siri, really isn’t in this game just yet). What is clear is that the usefulness of these devices is not just the very clever voice analysis technology, but also the services the various providers sign up. Getting these partners on board is key to the form’s success. Amazon is clearly backing Alexa in a much bigger way now, with them encouraging other manufacturers to add Alexa to their devices (e.g. Pebble phones, or the Raspberry Pi project), and they’ve announced that the next generation of Fire TV Stick will include Alexa capability in the remote. I also think that the adoption of voice interfaces is more likely to be successful inside the home or in the car than elsewhere. Despite phones having had Siri and Google Assistant for a number of years now, you rarely see or hear anyone using them in public, as you feel like a bit of an idiot. I’m much more comfortable talking to a device in the privacy of my home or car. The other thing critical to the success of these devices will be explaining to users how they work, and what they’re capable of. While geeks like me will explore to an extent, others will need lots of demonstrations to see their value. I find that too often, functionality is there, but a bit hidden away. You don’t know what you don’t know. That means lots of examples, and good, clear, documentation where appropriate. Great article Adam, many thanks for such a thorough piece. I pick mine up today and am already dreading the link up with the BT Hub. “A Small number of customers…” are affected apparently… Really Amazon! ?